Col de la Croix is an Alpine pass in the canton of Vaud in Switzerland. It connects Bex and Villars-sur-Ollon with Les Diablerets. The Grosse Scheidegg is a mountain pass in the Bernese Alps of Switzerland, The pass crosses the col between the Schwarzhorn and the Wetterhorn mountains at an elevation of 1,962m. 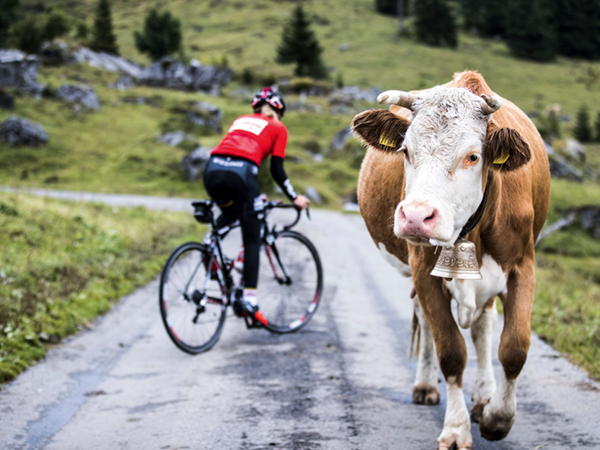 A cow passes a cyclist on The Grosse Scheidegg. A cycling track through Aigle; a historic town and a municipality and the capital of the district of Aigle in the canton of Vaud in Switzerland. Klausen Pass is a high mountain pass in the Swiss Alps connecting Altdorf in the canton of Uri with Linthal in the canton of Glarus. 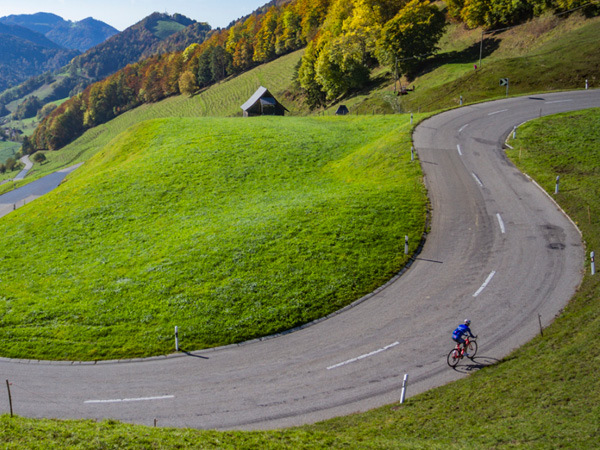 A stunning cycling track in Baselbiet, Switzerland. Tour of Lake Lucerne, Switzerland. With nothing between you and the view but the lenses of your sports sunglasses, hear the cow bells clang, breathe the fresh air and feel the atmosphere shift as you change altitude. 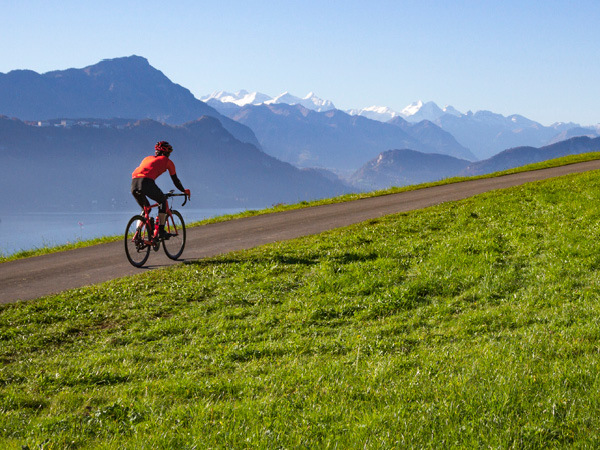 Road cycle touring in Switzerland allows you to connect more closely with the country’s dramatic landscape than car touring does, yet you cover far more ground with greater ease and speed than you can on foot. Cycle routes range from flat-out easy to epic multiday tours zig-zagging over some of the country’s highest paved passes. Though keep this in mind when planning: it’s Swiss people, raised around the alps, who grade them easy, moderate or difficult. Don’t feel you can’t catch the PostBus or utilise bike transport on steeper ascents. Start ‘easy’ by getting to know the countryside around one of Switzerland’s most beautiful lakes. The 68-kilometre Tour of Lake Lucerne begins and ends in a city that’s stood on that lakeshore since the Middle Ages. From Lucerne’s main railway station, cycle south along the waterfront to Hergiswil before diverting to one of the valley’s oldest settlements, Stans. Back at the lake, take a 15-minute boat ride from Beckenried to Gersau then head for the village of Weggis for a caffeine injection. From there the road gently undulates offering elevated views of Lake Lucerne and snow-capped mountains. Hire a bicycle in Lucerne from Boardlocal Bikelocal. Stein am Rhein: a small town west of Lake Constance (Bodensee), in northeastern Switzerland. Swiss Rhine Highlights is a four-day/three-night tour that’s as ‘easy’ on the eye as it is on the legs. For 160 kilometres from Kreuzlingen/Gottlieben to Rheinfelden you’ll follow the general course of the Rhine with only minor ascents. Get to know one of Switzerland’s major rivers and see Europe’s largest waterfall, Rhine Falls. This tour is available from May to October from around $435 per adult, which includes accommodation, luggage transfer, route guidance, travel documents, GPS data and service hotline. Single supplement and bike or e-bike hire at additional cost. The Jungfrau region has Europe’s highest railway station, top-class alpine hiking and one of the continent’s finest mountain passes – the Grosse Scheidegg (alt 1962 metres) – which is car-free apart from PostBuses and the odd tractor. This 80-kilometre circular alpine route, taking in that pass, has been deemed ‘moderate’. 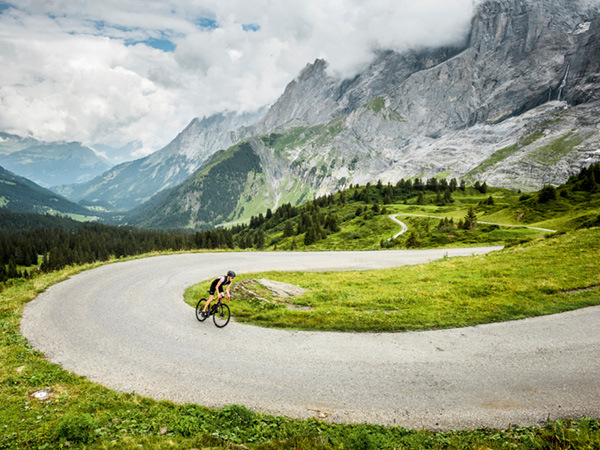 From Interlaken, tackle the route clockwise for a long lakeside warmup to Meiringen (alt 595 metres) before turning off for the Grosse Scheidegg ascent on which the road steepens to a gradient of up to 16 per cent. Yet the rewards are great: rock features up to 1700 metres high on either side of the road, the enormous Eiger and visible glaciers. Sail down the other side to the village of Grindelwald. 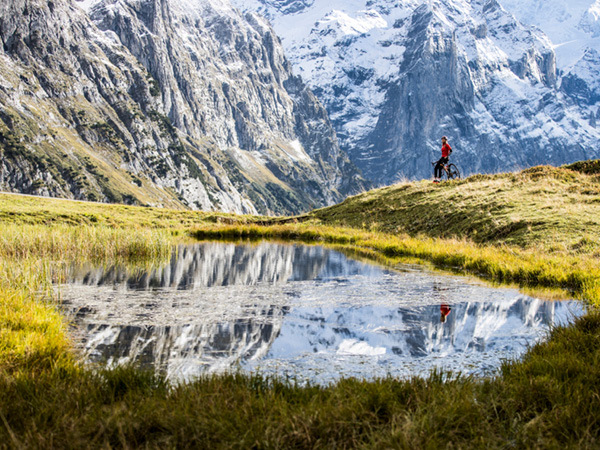 Hire a bike in Interlaken from Flying Wheels. The canton of Basel-Landschaft is locally known as Baselbiet. 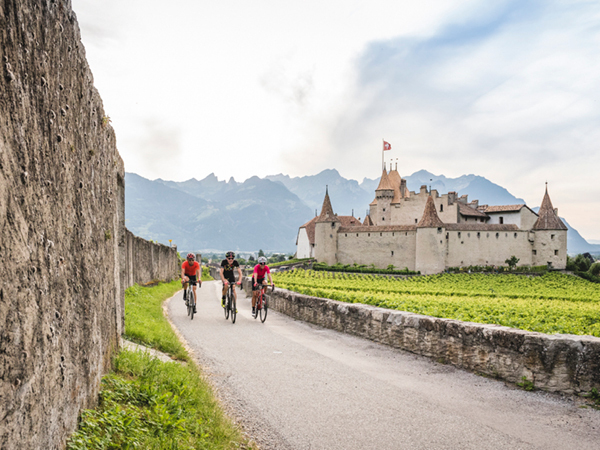 After easily negotiating your way out of Basel on a Swiss-engineered intercity cycle path network, explore country backroads and conquer a couple of passes on a 103-kilometre ‘moderate’ route. From Aesch, where urban gives way to rural, you’ll start to encounter some decent ascents with sweeping views of pastures, woodlands and wilder scenery. Enjoy the hairpins on the descent towards Balsthal. Hire a bike in Basel from Geneva-based BikeSwitzerland. 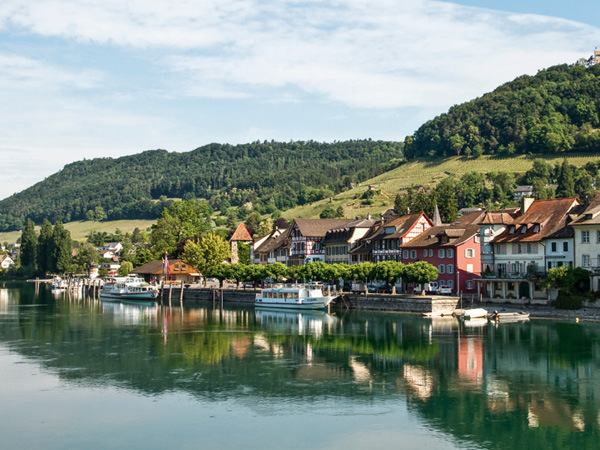 For those looking for a ‘moderate’ multiday trip consider the 4-day/3-night Lakes Route from Lake Geneva to Lake Thun overnighting in Gruyères and Gstaad. 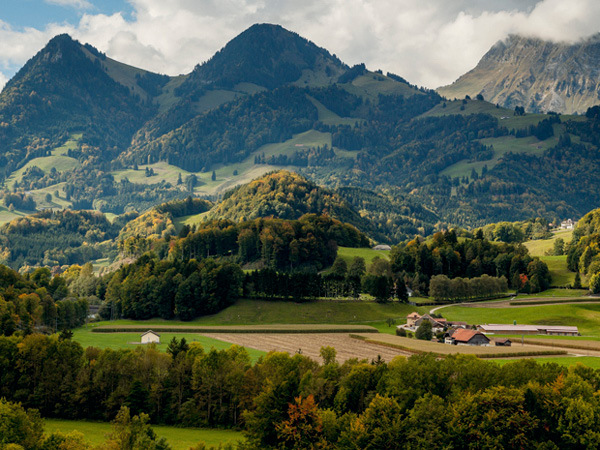 The rolling green countryside of this 135-kilometre hilly route is some of Switzerland’s prettiest non-alpine scenery. Start with a night in Montreux then, the next morning, catch the cog railway up Mont Pèlerin for an altitudinal headstart towards Gruyères and a fondue dinner. This May to October tour, from around $550 per adult, includes accommodation and luggage transfer. Single supplement and bike or e-bike hire at additional cost. Villars’ loop with a view, graded ‘difficult’, starts and ends in Villars-sur-Ollon/Gryon and demands you ascend 2250 altitudinal metres over a 92-kilometre route. It begins with a serious slog up to Croix Pass (alt 1774 metres) into the foothills of the Alps to overlook Lake Geneva and see the surrounding mountains. 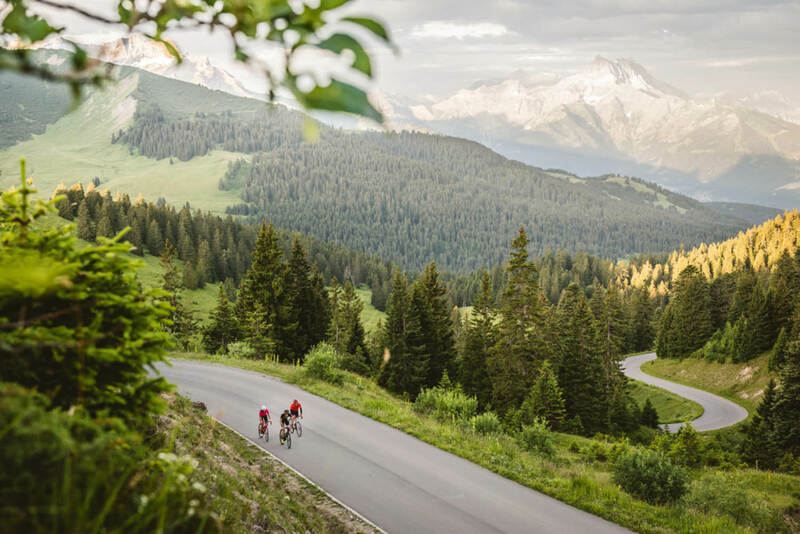 The views are particularly glorious on the descent to Les Diablerets (where you’ll want coffee) and, from there, sections of climbing and the grand scenery last all the way back to Villars. Hire a bike in Villars-Sur-Ollon or Gryon from McBoard/Paragon. Check beforehand that Petit Hongrin military zone and Agites Tunnel – both in the first 50 kilometres of the route – are open to traffic. 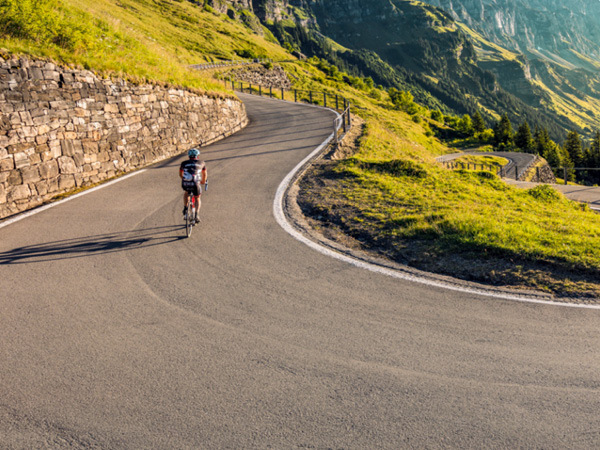 This 270-kilometre Alpine Panorama Route from Appenzell to Thun is a challenging cycling tour graded ‘difficult’. The highlight for most riders is Klausen Pass (alt 1948 metres) through the largest alp in Switzerland, called Urnerboden. The grass is definitely greener on the other side in the agricultural Schächental Valley with its mountainous backdrop. Stop overnight in Appenzell, Linthal and Lake Sarnen. Available late-May to mid-October, this tour is from $660 per adult and that includes accommodation and luggage transfer. Single supplement and bike hire at additional cost.